Whether caused by a motor vehicle crash, a workplace accident, or some other mishap, a spinal cord injury can have debilitating implications for victims and their loved ones. Those who suffer from severe spinal cord trauma may be left with permanent disabilities, which negatively affect every facet of their lives. When injury is caused by the wrongful or negligent actions of others, victims may be entitled to sue for monetary damages. Litigation may seem like a daunting prospect in the wake of such a life-altering injury, but legal compensation can help ease the burden of medical costs, ongoing rehabilitation and other expenses that threaten the livelihood and security of families. 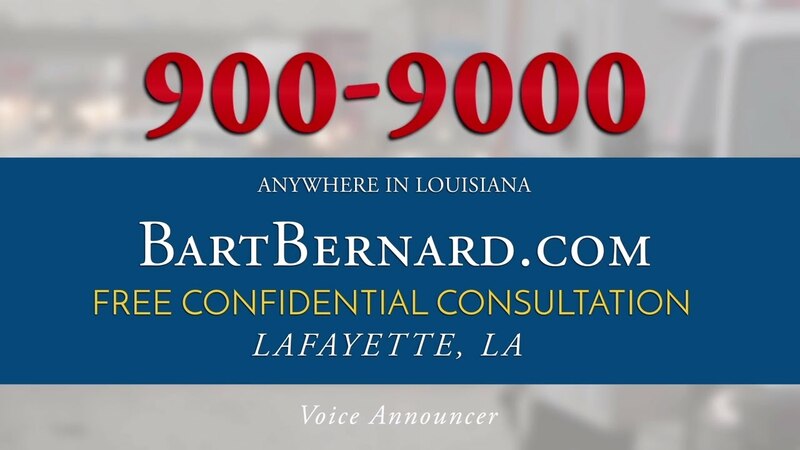 Bart Bernard is a highly skilled spinal cord injury lawyer in Louisiana who provides unwavering support and advocacy to victims of personal injury. His courtroom victories have earned him membership in the Multi-Million Dollar Advocates Forum and the Elite Lawyers of America, and his compassionate, personalized service have made him one of the most sought-after attorneys in the greater Lafayette and Baton Rouge areas. Bart possesses the experience, resources and dedication necessary to maximize the value of your spinal cord injury claim, ensuring you obtain full compensation for your pain and emotional suffering, lost income, hospital and medical expenses, reduced earning capacity, rehabilitation, loss of consortium, and other damages – past and future. By collaborating with top-notch neurosurgeons, physicians, and other spinal cord injury treatment experts, we can understand the mechanisms of your injury, your long-term prognosis and make sure that your settlement package or verdict accurately reflects all losses. Trauma or damage to the nerve cells in the spinal cord can lead to a cascade of secondary complications which may impair motor coordination, sensation, sexual function, bowel and bladder control and cause autonomic dysreflexia, chronic pain and spasticity. Trauma can occur in the cervical region, thoracic region, or lumbar/sacral region, leading to a “complete” or “incomplete” spinal cord injury. When the spinal cord is fully severed or compressed, this is known as a complete SCI, which results in total loss of sensation below the site of damage. Conversely, those who suffer an incomplete SCI still retain some level of motor function and sensation below the site of injury, and stand a better chance of recovering some mobility with intense physical therapy. According to research conducted by the Christopher Reeve Foundation, 4 out of 5 people living with spinal cord injury are male and more than 1 million Americans are living with paralysis caused by spinal cord injury. Recovery from an incomplete or complete spinal cord injury is an emotionally and physically grueling process. In some cases – especially those involving incomplete injuries — individuals may expect to recover partial or complete function within 18 months. In other cases, it may take years of intensive therapy, nerve cell treatments and rehab to recover some level of function after the injury. Without sufficient funds to cover hospital and medical bills, families may be pushed to the edge of bankruptcy. Bart Bernard and his team of medical experts perform a thorough evaluation to assess the severity of your spinal cord injury and ongoing medical needs, including occupational and physical therapy, medications, assistive devices and even psychological counseling. A successful spinal cord injury lawsuit can net fair reparations for all losses, helping victims on the road to recovery. Acute care focuses on stabilizing the spine and reducing inflammation. At this time, there is no cure for spinal cord injury, but treatments continue to advance with decompression surgery, complex drug therapies and modalities used to regenerate nerve cells. The sooner that individuals see improvement in muscle function and sensation, the better the long-term prognosis. Long-term SCI treatment may encompass surgery, prescription medications, occupational and physical therapy, targeted nutrition and diligent monitoring by health care professionals. Spinal cord injury lawsuits are typically based on the theory of negligence. In other words, another party’s misconduct, inaction or reckless behavior was the primary contributing factor to your injury. Because victims are frequently left with some level of severe impairment and lasting disability, ranging from paralysis to uncontrollable spasms and sexual dysfunction, damage awards tend to be substantial, sometimes reaching into the millions of dollars. The consequences of a spinal cord injury will vary tremendously from one person to the next. The fortunate will recover some sense of normalcy, while others may be confined to a wheelchair for the remainder of their lives. Bart Bernard focuses a great deal of his practice on catastrophic injury events and has years of experience successfully litigating spinal cord injury claims arising from falls, motorcycle and car accidents. We invite you to schedule a confidential, no-charge consultation in Lafayette or Baton Rouge today.